Fear is one of Satan’s key weapons. He knows if he can keep us fearful, he can keep us faithless. But God has called us to courageously believe His Word, to step up and step out in faith. And when we do, God shows up and works miracles in our midst. 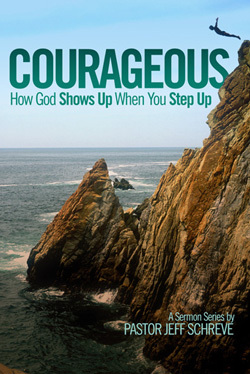 Join Pastor Jeff Schreve as he encourages us to overcome our fears with faith in this inspiring series called COURAGEOUS: HOW GOD SHOWS UP WHEN YOU STEP UP.